This booklet is a brief summary of my Creation Seminar Part Four, where I expose many lies found in nearly every public school textbook. The entire video series can be purchased from our web site www.drdino.com. We also provide a lot of helpful information addressing a wide variety of topics. Any questions you may have regarding the creation verses evolution debate can be asked live on our daily radio program. For further details, please visit our web site www.drdino.com. Are You Being Brainwashed By Your Science Textbook? 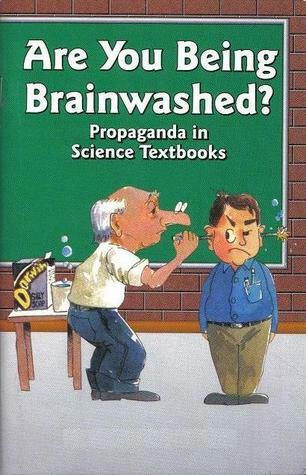 Brainwashed: to indoctrinate to a new set of beliefs. Evolution: this word has six meanings that are defined below. Science: knowledge gained by observation, testing and experimentation. I hate being lied to! After teaching high school science for fifteen years and now speaking on the topic of creation/evolution over 800 times per year for another fifteen years, and after 90 public debates with professors who believe in evolution, I am convinced that all of the "evidences" that are currently being used to support the evolution theory are lies. Most have been proven wrong many years ago. These lies are being kept in textbooks because someone wants you to believe their pet theory that we all came from a rock that came from nothing 18 billion years ago. Someone is trying to Brainwash you using your own science textbook! Follow me as I explain. Suppose, I had a theory that the moon is made of green cheese. I realize that is a dumb theory, but there is no law against having dumb theories. Then, suppose I told you that NASA had proved my theory when they went to the moon in 1973, drilled a test hole and discovered the moon is really made of green cheese. While it is perfectly fine for anyone to have a dumb "green cheese" theory, it would be wrong to use lies (like the made up NASA story) to supposedly support the theory. It would be even worse to be accepting tax dollars for a salary while I lie to support a dumb theory! Some people believe in the evolution theory, which teaches that we all came from a rock 4.6 billion years ago. I think that is a dumb theory, but remember, it is okay to have a dumb theory. I don't mind people having a dumb theory, but I do mind seeing lies used to support the theory and I really get upset when they want to be paid with everyone's tax dollars while they teach lies to support their dumb theory! I'm in favor of science and in favor of using the scientific method to support or refute theories. I am not trying to get evolution theory out of the schools. If there is real evidence for evolution, I would like to see it. Since 1991, our ministry has offered $250,000 to anyone who can provide real scientific evidence that supports evolution. So far, no scientific evidence has been given. (See www.drdino.com for details and the feeble attempts to collect by people trying to defend the evolution religion). There is no evidence for evolution. I think it is time to call it a religion and remove lies from science books. It might be okay to teach evolution in religion or fairy-tale classes but not in science classes at taxpayer's expense! In 1859, Charles Darwin published a book titled, "On the Origin of Species By Means of Natural Selection or the Preservation of Favored Races in The Struggle for Life." In this book, Darwin claimed that he was giving a scientific mechanism to explain a theory that had been around for many centuries. This theory was that all life forms came from a common ancestor millions of years ago and there was no need for a designer to be involved in the process. This theory is being taught today in grade schools, high schools, universities, science centers, and museums all across the world. Millions believe it and teach it without question. Is this theory true? What evidence has been given in the last hundred and fifty years to support Darwin's theory? What if you discovered that all of the evidences being used to support this theory had been proven wrong? What if you discovered you have been lied to or Brainwashed by your science textbook? Would it make you wonder why these false "evidences" were still in your textbook? Is it possible that much of the entire world has been Brainwashed into believing a theory that is wrong? What should you do about it? Answering these questions is the purpose of this book. Before we discuss evolution, it is important to define what we are talking about. There are six different meanings, levels or stages to the word "evolution." 1.Cosmic Evolution -the origin of time, space, and matter from nothing described as the "Big Bang." 2.Chemical Evolution - the origin of higher elements from the hydrogen supposedly produced in the: "Big Bang." 3.Stellar and Planetary Evolution - the origin of stars and planets from dust clouds. 4.Organic Evolution - the origin of life from non-living matter (i.e.) spontaneous generation. 5.Macroevolution - one kind of animal changes into another kind such as an amoeba slowly becoming an elephant. 6.Microevolution - the variations that occur within the kinds such as dogs and wolves having a common ancestor. Of these six meanings to the word, only number six is actually scientific. The first five stages of evolution are totally unsupported by scientific evidence and are based on wishful thinking that has never been observed, and only takes place in the imagination. No one has ever seen a dog produce a non-dog and they certainly have not seen something come from nothing or non-living matter come alive! When we refer to "evolution" in this book we are referring to the first five meanings above. Nearly all people agree that number six, "variations within the kinds," is clearly evident throughout this world. The two primary questions that this brings forth are best summarized as the following, "Can these observed minor changes be used as evidence for the other five? Or are you being Brainwashed into believing something that is not true?" The general theory of evolution teaches that the earth formed 4.6 billion years ago as a hot molten mass. Over the next billion years, it slowly cooled down and developed a rocky crust. Then, it "supposedly" rained on the rocks for millions of years and turned them into soup. About 3.5 billion years ago this "soup" came alive, found someone to marry, something to eat and slowly evolved into every living thing on the planet. This is certainly what the textbooks teach! What difference does this make? Who cares about creation or evolution? Actually this is one of the most important topics in the world! In my 90 debates with evolutionists, I often ask the simple question, "If evolution is true, how can anyone tell right from wrong?" My opponents never answer the question. Think about it. Make a list of ten things that are wrong, but before you make the list, I want you to explain how you decide what is right and wrong. Does Congress decide right from wrong? Should Osama Bin Laden decide right from wrong? Should Adolph Hitler decide right from wrong? Maybe you should decide right and wrong for you and I will decide it for me. In that case, what if I decide it is okay to steal from you? Where is the standard for deciding right from wrong? There is no such thing as right or wrong, there are no "absolutes." You are an accident an have little or no value. Your presence here is a burden on the planet since you are one of the poluters. It would be better for the world if you died. Now, try to have a positive self-image! Take a class on self-esteem. The other option is that you were designed by an all-powerful Creator who has a purpose for each of us. When you die, you face the Creator to give an account for your life. `Your duty here is to find out what the Creator wants, and do it since He is the owner of the universe and makes the rules! These two views of life are as opposite as any two views could be. At leash one of them is wrong! We will discuss the creation view at the end of this book. Here are just a few examples of the lies being taught in just about every science textbook in the world. Many more lies are exposed on our Creation Seminar Part Four. Lie #1 - "Grand Canyon Took Millions of Years to Form." The Grand Canyon in Arizona is 270 miles long and over one mile deep in many places. As you can see in the pictures, the top of the ridge that the canyon cuts across is about seven to eight thousand feet above sea level. The river enters the canyon at 2,800 feet above sea level. It is quite obvious that rivers do not flow up hill, so the question would be: how did the river start cutting the canyon? Anyone with half a brain should realize that there used to be a huge lake behind where the Grand Canyon currently is. This lake over flowed the top at some time in the past and carved this canyon in a matter of weeks. Three miniature Grand Canyons were formed in a matter of hours after Mount St. Helens exploded in 1980. (You can learn much more about this on our Creation Seminar Part Four and Part Six). The altitude difference can clearly be seen here in this satellite image. The snow line clearly differentiates high and low altitudes. Lie #2 - "The Geologic Column is a Fact." Textbooks teach that each of the layers of the earth is a different age. They even assign names (like "Jurassic") and "index fossils" to these layers. This entire "geologic column" was invented in the early 1800s primarily by Charles Lyell, a Scottish Lawyer. It does not actually exist any place on planet earth except in the textbook and the hyperactive imaginations of some evolutionists. If this column actually existed in one place it would be 100 miles thick. "Eighty to eighty-five percent of Earth's land surface does not have even 3 geologic periods appearing in 'correct' consecutive order. It becomes an overall exercise of gargantuan special pleading and imagination for the evolutionary-uniformitarian paradigm to maintain that there ever were geologic periods,"3 (Woodmorappe, J., 1981, p. 47-71). It is easy to prove the layers are not different ages. All over the world thousands of petrified trees have been found standing up running through many of these rock layers. It should be quite obvious to anyone that the layers formed very rapidly. Trees don't stand up for millions of years after they die, simply waiting for rock to form around them. A gigantic flood is the best explanation for this phenomenon. Obviously, the layers formed within a few weeks or months of each other before the tree could rot. The layers are not different ages, by millions of years, like the book says. Someone is trying to Brainwash you! Lie #3 - "Natural Selection causes evolution." Nothing could be further from the truth. Natural selection certainly happens, but it is only a 'selection' process. It does not create anything. Natural phenomenon such as weather may select a particular species of dog to survive. For example, in cold climates only dogs with thick fur will survive. In hot climates, dogs with thinner fur tend to survive better. This process is not creating anything new in the dog family; it is only selecting a slice of the gene code that already exists. Natural selection certainly works but it does not cause evolution. Someone is trying to Brainwash you! Lie #4 "The Peppered Moth." Textbooks often show the Peppered Moth as an example of evolution. The entire story is a total fabrication of the truth. Someone glued dead moths to a tree trunk to take the picture that is often shown in textbooks. The truth of the matter is, the moths have always produced two colors of babies, dark and light. Even if the story they tell about trees turning dark from pollution and the dark trees providing camouflage for the dark moths were true (it is not! ), it would still not be an example of evolution. Nothing would have changed. It is still a moth. It is still the same species of moth. Only the percentage of the population would have changed. Don't let someone use the Peppered Moth story to Brainwash you into relieving that we all came from a rock 4.6 billion years ago! Lie #5 - "Homologous Structures." Biology textbooks nearly always claim that the similar structures of most four-limbed animals are proof that they all have a common ancestor. They will point out that humans have two bones in their forearm, whales have two bones in their front flipper and birds have two bones in their wing. Then they will say this proves these animals have a common ancestor. This, of course, is ridiculous. The similar structure of these animals' limbs proves they have a common designer, not a common ancestor. If you study the subject more deeply, you will learn that the bones of these different animals come from totally different genes in the chromosomes. They are not "homologous structures' as the textbook says. They are simply an example of an amazing design. Someone is trying to Brainwash you! Another example often given to try to convince students of the evolution theory is the long discredited idea that the embryo growing in the mother has "gill slits." Ernst Haeckel, a German embryology professor, invented this silly idea in 1869, after he read Darwin's book. He claimed that the embryos of all different animals look very similar as they develop inside their mother. He even made huge charts of his drawings of these different unborn creatures and traveled all over Germany and converted people into believing the evolution theory. Above, top row: Haeckel's drawings of several different embryos, showing incredible similarity at their early 'tailbud' stage. Bottom row: Richardron's photograph of how the embryos of these same animals really look at the same stage. The truth of the matter is, he lied. His own university held a trial and convicted him of fraud. While it is true the human embryo has little wrinkles of skin under its head, these are not gill slits. They never functioned as a breathing apparatus at any time. Actually, the little folds of skin develop into bones in the ear and glands in the throat. To teach that the embryo has gill slits is simply a lie. This teaching needs to be removed from real science textbooks. It is interesting that this idea has been proven wrong since 1875, yet it is still used in textbooks all across the world as evidence for evolution. It appears that someone is trying to Brainwash you into believing their theory. It is also a heart-rending fact that this is the scientific evidence used to justify abortion. Abortionists would like for us to believe that the baby growing inside the mother is not yet a human being. Nothing could be further from the truth. Someone is trying to Brainwash you! Lie #7 - "Vestigial Structures." One of the evidences that supposedly supports evolution is the idea that we have "vestigial structures." A vestigial structure is believed to be something that we no longer need. Usually textbooks give examples like the human tailbone and say it is a vestigial structure. This is simply a lie. There are nine little muscles attached' to Human the tailbone that are essential for several functions in the human body. Anyone who tells you that the tailbone is vestigial is either ignorant of human anatomy or is lying in an effort to Brainwash you into believing a theory. Don't believe it! We have a long-standing offer at our ministry. If anyone thinks the tailbone is vestigial, I will pay to have theirs removed. Textbooks often state that the human appendix is also vestigial. This is silly. While it is true you can live without your appendix, this does not mean that you do not need it. The appendix is part of your immune system. "Long regarded as a vestigial organ with no function in the human body, the appendix is now thought to be one of the sites where immune responses are initiated,"6 (Hartenstein, 1998). If your appendix is taken out, you have a much greater chance of getting quite a few diseases. For example, "its removal also increases a persons susceptibility to leukemia, Hodgkin's disease, cancer of the colon, and cancer of the ovaries,"7(Brown, p.18). Sometimes it is better to lose your appendix than to lose your life, but your appendix is not vestigial. Obviously, you can live without your legs, your arms and both your eyes, too. Just because you can live without something does not mean that you don't need it, nor does it prove that it is evidence for evolution. By the way, even of there were vestigial organs [there are not], isn't that losing something not gaining something? Is that how evolution works, you lose things until you have everything? Thousands of schools around the world teach their students that the whale has a vestigial pelvis. They will point out that in the abdomen of the whale there are four bones that are not connected to the spine. They will then claim that this is evidence the whale used to have legs and walk on land. Actually, special muscles attached to these bones allow the whales to reproduce. These bones have nothing to do with walking on land. They have to do with getting baby whales. The authors of textbooks that are claiming this is a vestigial pelvis in a whale is either ignorant of his whale anatomy or is trying to Brainwash you into believing a theory. Don't fall for it! Lie #8 - "Plants and Animals have Adapted to Their Environment." While it is true that variations happen and animals can adapt within limits, the textbooks teach or imply that there is no limit to the adaptations. One atheist I debated said, "Given enough time a cow can adapt to the water and become a whale." They use the word "adapted" to avoid using the word "designed" to describe the amazing features found in all animals and plants. Design, of course, demands a designer. Everywhere we look in nature, we see evidence of design. The evolutionists, would like you to believe that this is just a coincidence, and that there really is no design. It is all a result of a random accident. Imagine if you are walking through the woods and find a painting hanging on a tree. You may look around discovering there are no footprints, there are no people and there is no evidence of anyone ever having been there, yet there is still a painting hanging on a tree, what would you conclude? Obviously, you would conclude there must have been a painter. Even if you can't find the painter, you know that the painting itself is proof of the existence of a painter. It is clearly evident that if there is a building, there was a builder. And, we know from creation that there was a creator. It is obvious there was a creator because of the absolute insanity of the contrary. It is impossible that there not be a designer for such a complex universe such as we see. Lie #9 - "Complex Structures, Like the Eye, Can Evolve in Small Steps." In Charles Darwin's book he said, "To suppose that the eye. . .could have been formed by natural selection seems, I freely confess, absurd in the highest degree,"8 (p. 217). Darwin, then goes on for several more pages explaining how he thought it might have happened. In order, to get students to believe that a complex structure such as the eye could have formed by chance, textbooks will often show examples of different types of eyes from reptiles, birds and even light sensitive spots from smaller creatures and then they will arrange them in order claiming that this is an example of evidence as to how the eye evolved. Obviously, arranging things in some of artificial order is not evidence for anything. Each creature in the world seems to have the type of eye that it needs to survive in its environment. Each type of eye is incredibly complex and conspicuously designed. One textbook states, "You can better understand how the eye might have evolved if you picture a series of changes during the evolution of the eye. "9 Apparently, this book intends for them students to "picture" or "imagine" how the eye might have evolved. This is definitely not science. This might be somebody's religion. The fact is the eye is far too complex to have evolved piece by piece. The eye illustrates what is called, irreducibly complex. If certain components in the eye are missing, it ceases to function. Lie #10 - "Trees of Life." Textbooks often show pictures of a "tree of life" and leave the impression that the picture itself is now evidence that it happened. Just because we can draw lines between different types of animals does not prove they have a common ancestor or even any relationship. Even if fossils are found in a particular order (and they are not), this would not prove any relationship. For example, if I get buried on top of a hamster, does this prove that he is my grandfather? It obviously, does not. All of these trees of life with branches of ancestors are nonsense. People are welcome to believe that different organisms are related, however; this certainly is not science and should not be taught in a science book. Be careful	you don't get Brainwashed by seeing a picture. "All those trees of life with their branches; of their ancestors, that's a lot of nonsense,"10 (Leakeji, 1996). "The evolution trees that adorn our textbooks have data only at the tips and nodes of their branches: the rest is inference, however, reasonable, not the evidence of fossils. "11 (Gould, 1977). Lie #11- "Smaller is Simpler." Some textbooks will try to teach you that just because a creature is smaller it is, therefore, simpler. They will talk about "simple organisms" and refer to things like bacteria. Nothing could be further from the truth. A bacteria is extremely complex. Bacteria have little hairs called flagella that allows them to swim through their little world. These flagella are attached to a tiny motor that spins at 100,000 RPM, faster than most motors built by man. As you study advanced molecular biology, you will see that even a small bacteria is more complex than a space shuttle, the most complex machine ever built by man. Ask any computer expert if smaller is simpler or more complex! Don't get Brainwashed into believing that smaller is simpler! Lie #12 - "The Horse Evolved from a Four-toed Ancestor." Textbooks frequently show a series depicting a small four-toed "horse" evolving into a larger one-toed horse. This entire sequence has been proven wrong over fifty years ago and should not be allowed in any public school textbook in the twenty first century. "Other examples, including the much-repeated 'gradual' evolution of the modern horse, have not held up under close examination." 12(Starr & Taggart, 1992, p. 304). "Many examples commonly cited, such as the evolution of the horse family or of saber-toothed 'tiger' can be readily shown to have been unintentionally falsified and not to be really orthogeneticy"13 (Simpson, 1950, p. 264). "The early classical evolutionary tree of the horse, ....was all wrong,"14 (Science Newsletter, Aug 25, 1951, p.118). Othniel Marsh made up the entire horse evolution series in the 1870s. He gathered fossils of animals from all over the world and arranged them in the order he thought they might have evolved. He did not find them in this order nor did he find them in one location, nor did he have any evidence that any of these animals were even remotely related to each other. The Hyracotherium, the so-called ancient horse is a small four-toed meat-eating animal still alive in Turkey and East Africa today. It is not even remotely related to a horse. Even though the horse evolution idea has been proven wrong over fifty years ago, modern textbooks still teach it as if it were a fact. Don't get Brainwashed by this one! Lie #13 - "Dinosaurs Evolved into Birds!" It is surprising that modern textbooks teach the ridiculous idea that birds are the descendents of dinosaurs! What a silly idea! There are many thousands of anatomical differences between reptiles and birds. Reptiles have four perfectly good legs that function just fine. Birds have two legs and two wings which also work fine as they are. If a reptile were to try to evolve into a bird, at some point it would have half leg and half wing. Now, it can no longer walk, or run yet, it cannot fly. This creature is doomed to extinction. The fossil that evolutionist often use to try to Brainwash you into believing that dinosaurs turn to birds is called Archaeopteryx. Many experts throughout the years have argued that Archaeopteryx is nothing but a perching bird. "Paleontologists have tried to turn archaeopteryxes into an earthbound feathered dinosaur but not. It is a bird. A perching bird and no amount of Paleo babble is going to change that,"16 (Feduccia, 1994, p. 764). After Charles Darwin's book was published in 1859, the first Archaeopteryx fossil was found. It was identified as being simply a bird. Later, when no missing links could be found, someone decided to use this one as a missing link. The word Archaeopteryx means ancient wing. This bird had claws on its wing, which is indeed unusual, but the Swan, the Ibis and the Hoatzin as well as nine other birds today have claws on their wings. While it is a little unusual for a bird to have claws, it is not evidence that the creature evolved from a dinosaur. Archaeopteryx also had teeth in its beak. Very few birds have teeth in their beak today. There is a hummingbird in Panama that has 48 teeth in its beak. (National Geographic 1991.) Obviously, going from teeth to no teeth is losing information not gaining. This process will never cause evolution. In their feeble effort to Brainwash students, evolutionists often point out that feathers and scales are both made of the same protein, keratin. They will tell you that this proves that feathers evolved from scales. The book will use fancy terms to make it sound official such as, "dinosaurs had some avian characteristics." Well, a bicycle has certain "automotive characteristics," like a frame and tires but this does not prove cars evolved from bicycles over millions of years! Evolution theory is certainly based on fuzzy logic. Battleships and tin cans are both made of the same metal. It does not prove they both evolved from forks. Keratin is a strong light weight, very useful protein that is used in many substances. This is evidence that an intelligent designer created both features. Feathers and scales attach to the skin differently and come from different genes on the chromosomes. There is no evolutionary relationship between the two. For reptiles to turn to birds, the heart, the lungs, the brain, the skeletal system, the nervous system, the body shape, and the reproductive system would all have to be radically altered. There is no evidence of any such change taking place. Any textbook that teaches that dinosaurs evolve to birds is teaching pure imagination unsupported by real scientific evidence. Lie #14 - "The Earth is Billions of Years Old." Textbooks often teach that it has been proven that the earth is billions of years old. While it is true that many people believe the earth is billions of years old, this has certainly not been proven. There is overwhelming scientific evidence to demonstrate that the earth is only a few thousand years old. Dozens of these examples are explained on our Creation Seminar Part One, available on our website www.drdino.com. For example, the population growth curve clearly shows that man has only been on earth for a few thousand years since, Noah's flood 4,400 years ago. If man has been here three million years, it is evident that there should be many times more people on earth. Even if the earth were billions of years old, this would only be the fast of millions of obstacles evolutionists, would have to overcome for their theory to be true. They still must get impossible things like: matter from nothing, life from non-living matter, living things learning to reproduce themselves, living creatures producing different kinds of offspring etc. None of this is ever observed. It only takes place in the imagination of the evolutionist. Adolph Hitler said, "If you tell a lie long enough and loud enough and often enough, people will believe it." Be careful that you're not getting Brainwashed into believing the earth is "billions of years old" just because that's all you've heard your whole life. Lie #15 - "Cave Men." Nearly every Biology textbook these days teaches students that man evolved from an ape-like ancestor. All of the examples given as evidence for this supposed transition have been proven false over the years. The famous "Nebraska Man" was actually made from one tooth, which later turned out to be the tooth of a pig. The "Piltdown Man" found in 1912, was used for over forty years as evidence for evolution. In 1953, it was discovered that it was a complete hoax. Someone had purposely hidden a chemically treated humans skull cap and an apes jaw and tried to make everyone believe that they had found the missing link. "Lucy" was found in 1974 and is nothing more than a three-foot tall chimpanzee type animal. It is not a "missing link." There is much more information about this topic on Creation Seminar Part Two; in the book, Bones of Contention by Marvin Lubenow and Buried Alive by Jack Cuozzo. Don't be Brainwashed into thinking your ancestors swung by their tails! Lie #16 - "No Human Being has Ever Seen a Live Dinosaur." This is not a scientific statement. This author would need to talk to every person who ever lived to know this to be true. The truth is that dinosaurs have always lived with man. They were called dragons for most of human history and man killed most of them. In 1841, a new name "dinosaur" was given to them. It is quite possible that a few are still alive. There have been thousands of sightings of creatures such as the Lock Ness Monster or the dead dinosaur that washed up on the beach in California in 1925. More pictures are available on www.drdino.com as well as dozens of references throughout history that can be seen on our Creation Seminar Pat Three. Lie #17 - "DNA Proves Evolution"
1. Dr. Barney Maddox, the leading genetic genome researcher, concerning these genetic differences said, "Now the genetic difference between human and his nearest relative, the chimpanzee, is at least 1.6%. That doesn't sound like much, but calculated out, that is a gap of at least 48,000,000 nucleotides, and a change of only 3 nucleotides is fatal to an animal; there is no possibility of change,"17 (Maddox). 2. The difference is now known to be 5% not 1.6%. "It has long been held that we share 98.5 per cent of our genetic material with our closest relatives. That now appears to be wrong. In fact, we share less than 95 percent of our genetic material, a three-fold increase in the variation between us and chimps." Human-chimp DNA difference trebledБ─· 23 September 02, NewScientist.com news service. 3. Similarities in the DNA code simply prove the same designer wrote the code. This is not evidence for evolution, it is actually proof for creation! 4. DNA is so incredibly complex that the chances of just one DNA molecule arranging itself by chance has been estimated to be 1 in 10119,000 That is a huge number when you consider the entire visible universe is only 10282 inches in diameter! All the DNA from one person would fill about two tablespoons yet, if all the DNA strands were tied end to end and stretched out it would reach from earth to the moon and back five million times. Anyone who says DNA happened by chance is Brainwashed! Lie #18 - "When You Die, You Cease to Exist." This is one of the most dangerous lies textbooks teach. God created the universe and left us a record of how and why He did it. You were created by an all-wise Creator and you will live forever in Heaven or Hell. All humans have broken God's laws by lying, cheating, stealing, etc. Being a "Just" and "Holy" God, He cannot simply overlook our sins. Either we must be punished by going to Hell forever or we must accept the perfect substitute God provided in Jesus Christ. Satan is a liar. John 8:44, "Ye are of your father the devil, and the lusts of your father ye will do. He was a murderer from the beginning, and abode not in the truth, because there is no truth in him. When he speaketh a lie, he speaketh of his own: for he is a liar, and the father of it. "18 Satan is using lies to keep people from coming to Christ to be saved. In my fifteen years of traveling and speaking on the creation/evolution subject, I've done ninety debates against people who believe in evolution. I often ask them the question: If evolution is true, how does anyone tell right from wrong? If evolution is true there is no possible way to tell right from wrong. Survival of the fittest becomes the way of life. Why Would Textbook Authors Teach Lies dust to Get Someone to Believe in the Theory of Evolution? Why would anyone want to Brainwash students into believing this theory? There may be many answers to this complex question. Let me give you just a few that I've thought of. 1. Some people believe in evolution and teach it to others because that is all they have ever been taught. They simply do not know any better. They may honestly not know that these things have been proven wrong-years ago. They simply may not be up to date on the research. If that is the case, we can fix that. They simply need to study the truth and stop teaching lies. If it happens that there is nothing left to support the evolution theory, well, I'm sorry, that's just the way science works. If someone has a theory, but no supporting evidence, that's their problem not yours or mine. 2. Some people teach the evolution theory because their job depends upon it. They may write things in books or teach things to students because they are required to. The fact that what they're teaching is wrong may or may not bother them. They think they are obligated to teach these lies and brainwash you because that's what they have been hired to do. In many instances, Hitler's soldiers executing the Jews in the concentration camps felt the same way about their job. 3. Some people hope there is no Creator because that may affect their life style. (See Romans 1:28). These people are desperately trying to get others to believe in their theory of evolution because they apparently think if everybody believes, then it will become true and they can avoid accountability to the Creator. 4. There may be some who present lies in the textbooks because of their social/political agenda. Many people who study this thoroughly understand that the evolution theory is the essential foundation for Communism, Socialism, Nazism, and Marxism. We cover much more on this topic on video tape number five of our series. 5.Lastly, some people may be presenting lies in textbooks or classrooms simply because they have too much pride to admit they are wrong. If someone has been teaching something for years and years and realizes they are wrong, in their mind it may be easier to continue teaching this than to admit they have taught something wrong for many years. What Can Students and Parents Do? Jeremiah 27:9-10, "Therefore hearken not ye to your prophets, nor to your diviners, nor to your dreamers, nor to your enchanters, nor to your sorcerers, [nor to your textbooks] which speak unto you, saying, [we have evidence for our theory of evolution and that there is no God that made you] ... For they prophesy a lie unto you, to remove you far from your land;"19 (I added the bracketed part). Regardless of the reason, the fact is there are things in textbooks, classrooms, museums and science centers across the world that simply are not correct. Whether they are taught deliberately or innocently, teaching these lies is going to Brainwash students into believing something that is not true. So the obvious question is, what should we do about it? The solution is quite simple: Isolate, Insulate or Initiate. Get your children out of the public schools, if possible. The problem with the lies in the books is not fixable in the short term and there is a great chance your student will be negatively impacted if you leave them in a public school setting. See Creation Seminar Part Four and Part Five for more on this. If you cannot get them into a private school, Christian school or home school, then insulate them. "75% of all children raised in Christian homes who attend public schools will reject the Christian faith by their first year of college. "20 (Matritiano). You would not send your children into any hostile environment like the moon, a battlefield or the bottom of the ocean without proper protection would you? To send them to the bottom of the ocean without properly working equipment like a submarine or scuba gear would be murder wouldn't it? (The same would be true about sending them into battle or to the moon without training and protection). Be sure they are properly trained and equipped to handle the Brainwashing they are sure to face in the public school system. You can send a letter to the teacher stating that it is against your religion to have your student taught evolution. (Sample letter below). The school is required to provide alternative material. I know there are thousands of dedicated Christian teachers in the public schools but the fact is; students will face lies in their books, by some teachers, counselors, and tests like ACT, SAT, (etc) will be full of evolution questions based on those lies. Get them out or prepare them for the battle. Dear (insert Teacher's name), This letter is to inform you that it is against my religious conviction to have my student taught that the earth is billions of years old, that man evolved from an apelike ancestor or that all life forms developed from primordial soup. Please, exempt my student from class when these teachings are taking place. Thank you for your help in this matter. Whether you leave them in or get them out you can also initiate a plan to fix the problem. NOTE: For more on this subject see Appendix A. Sign your name, have it notarized and give a copy to the teacher and a copy to the school principal. Take the initiative to make a change! You can require that lies not be taught in school at your expense. Most states have laws requiring textbooks to be accurate (some are listed below). Simply demand that lies be taken out of the textbooks. We are not recommending that anyone try to get evolution out of the schools or get creation into schools. If someone has evidence for a theory, that's wonderful, show it to us. We are not against science. We are simply against lies. I recommend students or parents try to confront their teacher privately, if possible. After class speak with the teacher and say something to this effect, "do you realize there is a mistake in our textbook? Then, try to get the teacher to cross it out and remove it from text. If you cannot get any change at this level, the student and or the parent of the student still have several other responsibilities. I think it is our responsibility to be sure other students in the class are not Brainwashed into believing something that is not true. So you may want to pass out booklets such as this one to fellow class members. If a question comes up on your test that requires an answer that you know to be wrong, you can always answer, "The textbook says... however, this is not correct." If a teacher lowers your grade for this, see the letters in "How to Establish the Record" below for the proper steps to take. State laws requiring accuracy ire textbooks. Alabama Code 1975, Section 16-36-70 "Adequate textbooks" - provides: "(b) All students in the public schools shall be provided with adequate and current textbooks ...."
Florida Statute 1006.35 Accuracy of instructional materials. (1) In addition to relying on statements of publishers or manufacturers of instructional materials, the commissioner may conduct or cause to be conducted an independent investigation to determine the accuracy of state-adopted instructional materials. Minnesota. 8700.7500 Code of Ethics for Minnesota Teachers Subpart 2. Standards of Professional Conduct. G. A teacher shall not deliberately suppress or distort subject matter. Texas Administrative Code Title 19-EducatioN #66.66 (I) "Instructional materials shall present the most factual information accurately and objectively without editorial opinion or bias by the authors. Theories shall be clearly distinguished from facts and presented in an objective manner." If your state does not have a law requiring accuracy, it is still common sense that lies should not be allowed in the textbooks just to get students to believe a particular theory. Demand that schools provide textbooks free of errors. They can cut out pages from existing books for little of no expense. Most churches would be glad to supply a long list of people willing to volunteer their time to do this and bring their own scissors! There are many thousands of scientists who do not believe in evolution. Here are quotes from just a few of them. "Evolution is not a fact. Evolution doesn't even qualify as a theory or as a hypothesis. It is a metaphysical research program, and it is not really testable science,"21 (Popper). "I suppose the reason why we leapt at the Origin of species was that the idea of God interfered with our sexual mores,"22 (Huxley). "Evolution is promoted by its practitioners as more than mere science; Evolution is promulgated as an ideology, a secular religion Б─■ a full-fledged alternative to Christianity, with meaning and morality. I am an ardent evolutionist and an ex-Christian, but I must admit that in this one complaint -- and Mr. Gish is but one of many to make it -- the literalists are absolutely right. Evolution is a religion. This was true of evolution in the beginning, and it is true of evolution still today,"23 (Ruse). "Evolution is unproved and unprovable. We believe it only because the only alternative is special creation, and that is unthinkable,"24 (Sir Arthur Keith). "Transformism (evolution) is a fairy tale for adults,"25 (Rostand, 1959, p. 12). "The theory [of evolution] has helped nothing in the progress of science. It is useless,"26 (Bounoure, 1957, p. 79). "It results from this explanation that the theory of evolution is not exact ... Evolution is a kind of dogma which its own priests no longer believe, but which they uphold for the people. It is necessary to have the courage to state this if only so that men of a future generation may orient their research into a different direction,"27 (Lemoine). I myself am convinced that the theory of evolution, especially the extent to which it has been applied, will be one of the great jokes in the history books of the future. Posterity will marvel that so flimsy and dubious an hypothesis could be accepted with the incredible credulity that it has,"28 (Muggeridge). "Scientists who go about teaching that evolution is a fact of life are great con-men, and the story they are telling maybe the greatest hoax ever. In explaining evolution we do not have one iota of fact,"29 (Tahmisian). What if evolution is not true? All of the evidence to support this theory has been proven wrong years ago. What if the whole theory is part of a major Brainwashing program designed to get students to doubt the only other alternative, which is that there was a Creator for this complex universe? If the universe was created, then obviously we should try to find out who created it and why and find our place in His creation. We believe the Bible provides the answer to these fascinating questions. God created the world in six literal days about 6,000 years ago. This world was destroyed by a world wide flood 4,400 years ago, leaving behind huge deposits of rotting debris which turned to coal, oil, natural gas deep in the ground, as well as billions of fossils all over the world and huge erosion marks called canyons as the flood water receded. We cover much more about this topic on our Creation Seminar Part Six of our series. Dinosaurs always lived with man. They were called dragons for most of human history and man killed most of them. There may be a few still alive today, which is why there are so many stories of sightings of Lock Ness monster type creatures. We cover much more of this topic on Creation Seminar Part Three. If the creation story is true and God created the world, then He must have done it for a reason. He created man for a reason also. He wants to have fellowship with us but we have disobeyed His laws. The Bible says we have all broken God's laws and deserve to be punished. However, God loves His creation and provided a way for us to be forgiven from our sins through the death of Jesus Christ on the cross. Anyone willing to repent of their sin, and trust Jesus as their Savior will be forgiven and will spend eternity with their Creator in Heaven. Be sure you are going! God gave clear commandments like: do not lie, steal, lust... The Bible calls this sin. The only solution for this sin problem is for Jesus Christ to forgive us of our sins. If you're not sure you are saved, please, give us a call or visit our website. We would be glad to talk with you m,ore about this. How to Establash the Record. In spite of the prevailing attitude in many schools and textbooks, students have an unparalleled opportunity to take a stand against the teaching of things that have been proven wrong years ago. It is amazing that so many lies remain in textbooks long after they were exposed. Knowing the specific flaws in the textbooks is only the first step. Students must learn their rights in public education so that they can confidently fend off the attacks intended to undermine their belief in God's Word and creation. Parents, teachers, and school board members as well as students, should be getting involved in influencing what is being taught in schools. God calls His children to be His ambassadors on earth. `Anyone who loves truth should be alarmed that there are lies in our books. Someone must rise to the challenge and root the lies out! In the unlikely event you will have to take legal action against a teacher or school, it is important that you properly establish a record of events. Everything must be done in writing. If you have any verbal conversations with a teacher for example, you can write out your summary and send it to the teacher as illustrated below. Often, a teacher will comply with your first request without any problems. Be kind and respectful, but firm. Here are a few simple ideas that may help. Sample letters to exempt your child from evolution teachin in schools. Thank you for giving of your time and energy teaching biology. Our son, Paul, has learned a great deal in your class. This letter is our NOTICE to inform you that we do not want our son taught that the earth is billions of years old, or that plants or animals have evolved from lower life forms over millions of years. This teaching is in clear conflict with our deeply held religious beliefs. The Bible clearly states that God created everything in six days and that all life forms only bring forth "after their kind." In accordance with Proverbs 19:27, "Cease, my son, to hear the instruction that causeth to err from the words of knowledge,"30 we must not let him be taught evolution theory. I know the school has clear policies against discrimination based on religious convictions, so when these subjects come up in class or on tests, please provide alternative materials for our son to learn. We are not asking for him to do less work than other students are required to do, just work in different areas that will not conflict with our religion. We would be glad to meet with you and discuss possible alternative material if you like. Please, send us a note that you received our request and will help us in this matter. Furthermore, please feel free to call us if you have any questions or problems with our son. Thank you for your understanding and cooperation in this matter. Thank you for the giving of your time and, energy teaching biology. Our son, Paul, has learned a great deal in your class. This letter is our NOTICE, as we mentioned in our conversation yesterday, January 8, 2004, that we do not want our son taught that the earth is billions of years old or that plants or animals have evolved from lower life forms over millions of years. This teaching is in clear conflict with our deeply heldreligious beliefs. The Bible clearly states that God created everything in six days and that all life forms only bring forth after their kind. In accordance with Proverbs 19:27, "Cease, my son, to hear the instruction that causeth to err from the words of knowledge," we must not let him be taught these things. I know the school has clear policies against discrimination based on religious convictions so when these subjects come up in class or on tests, please, provide alternative materials for our son to learn. We are not asking for him to do less work than other students are required to do, just work in different areas that will not conflict with our religion. We would be glad to meet with you and discuss possible alternative material if you like. Please, send us a note that you received our request and,will help us in this matter. Furthermore, please feel free to call us if you have any questions or problems with our son. We look forward to a great year. Thank you for your understanding and cooperation in this matter. 1. On January 9, 2004, I sent a letter (attached exhibit #1) to Mr. Jason Smith, my son Paul's biology teacher at Central High School in Pensacola, Florida stating that I do not want my son taught the evolution theory. I also sent copies of the letter to Mr. Bill Jones the school superintendent and to Mr. Young, chairman of the board of education. The letters were sent by first class mail on January 9, 2004. 2. On January 12, 2004, Paul brought home a note (attached exhibit #2) from his biology teacher, Mr. Jason Smith, that stated he would be assigning Paul other work to comply with our requests. On January 9, 2004, I sent a letter (copy attached) informing you that it is against our deeply held religious beliefs for our son Paul to be taught certain things mentioned in the letter. It is my understanding that you have not honored our request and continue to subject our son to teachings we clearly mentioned that we do not want him to hear. Please, correct this situation immediately and inform us in writing that you have done so. If we do not hear from you in five days, we can only assume that you do not intend to comply with our requests and will take appropriate action. Thank you for you understanding and cooperation in this matter. Mr. Fred T. Jones, Principal. We have twice requested that our son Paul's science teacher, Mr. Jason Smith, exempt him from teachings that conflict with our deeply held religious belief. To date, he has not honored our requests. This letter is to ask you to intervene in this matter. Please, schedule a time for us to meet with you, Mr. Young and Mr. Smith as soon as possible to discuss a peaceful resolution to this conflict. We have twice requested that our son, Paul, be exempted from teachings that conflict with our deeply held religious convictions as the attached letters clearly point out. The teacher has not honored our requests. We also requested a meeting with the school principal and superintendent and our request was denied. Please, let us know if you can assist us in this matter. Note: Keep in mind the seriousness of this action. If you make it to this level you must be committed to taking legal actions and following through with your lawsuit. Liberty Counsel helps in situations like this for free if they take the case. More information can be found in our 17-hour seminar series on creation, evolution, and dinosaurs. The seminar series can be viewed on our website www.drdino.com, or can be purchased on DVD, VHS, or CD. In addition to the seminar series, our ministry carries many books and materials on the topic. Creation Science Evangelism exists to promote truth and draw people to the Creator of the universe. Our staff would be glad to assist you with any questions you have concerning the removal of evolution from public school textbooks or discrimination against religious beliefs. How to know you're going to heaven. Having been raised in several churches as a child, I was confused about what was required of me to go to Heaven. Every church seemed to be saying something different, and I could not figure out who was right. One day, when I was 16, a friend of mine asked me if I knew for sure I was going to Heaven. I said, "I've been baptized 2 times, catechized, pasteurized and homogenized, what else is there?" He said, "That is not what I asked you. Do you know if you are going to Heaven?" He said, "Would you like to know?" I said, "Yes, I would." He took his Bible explained the way God has provided for sinful man to be cleansed and go to Heaven. There is only one way to Heaven. Some teach that all religions lead to Heaven. This is a lie of the Devil to keep people from learning the truth. 1. The first thing we must realize is that we are all sinners before a perfect and holy God. God cannot allow sin into Heaven. If He did, it would soon be like Earth. We are hopelessly and helplessly lost. God created the universe, He owns it and He makes the laws. God gave us His commandments and we have not kept them. Isaiah 53:6, "All we like sheep have gone astray; we have turned every one to his own way;" Romans 3:23, "For all have sinned, and come short of the glory of God," Unless a person realizes and admits they are a sinner, they cannot be saved. You (and I) have broken God's laws and commandments. This is called sin. God is a perfect God and cannot allow even one sin or sinner to enter Heaven. Because He is Holy and Just He cannot look on sin. So God had a problem. He loves you and wants you to live with Him but your sin makes that impossible without Christ. 2. Secondly, we must realize and admit that the penalty for our sin condemns us to hell. I Kings 8:46, "There is no man that sinneth not," Ezekiel 18:4, "Behold, all souls are mine;... the soul that sinneth, it shall die." Romans 6:23 "For the wages of sin is death; but the gift of God is eternal life through Jesus Christ our Lord." We cannot save ourselves. We are guilty before a righteous Judge who cannot overlook our sin. The only thing that can pay for sin is death. In the Old Testament it was death and blood of the lamb that covered their sins from God's eyes. So God Himself became a man (Jesus) and died on the cross in your place. He is called "The Lamb of God" in the Bible. However, this Lamb was different. His blood does not cover your sins, it washes them away forever! The only problem now is how can I get the blood of Jesus put on my sin account. 3. God loves us and wants to save us from our sin. John 3:15-16, "whosoever believeth in him (Jesus) should not perish, but have eternal life. For God so loved the world, that he gave his only begotten Son, that whosoever believeth in him should not perish, but have everlasting life." John 10:28, "And I give unto them eternal life; and they shall never perish, neither shall any man pluck them out of my hand." Since we have all sinned, only a perfect substitute can die in our place. Suppose you had murdered someone and were standing before the judge being tried for your crime. The judge must be fair and obey the law so he pronounces you guilty and sentences you to death for your crime. Then, the judge takes off his robe, steps down to where you are and says, " I love you. I don't, want you to die. I will take your punishment for you. I will die in your place. This is the only way the law can be satisfied and you get set free at the same time. This is what God did. We were guilty oбё sin and deserving of death but He took our place." Now, His blood can pay for our sin if we ask Him to save us. All we need to do is believe that He died for us (and rose from the dead) and receive His free gift of eternal life. You received a free gift of physical life from your parents. You did not pay for it, work for it or deserve it. They did the work, paid the bills and went through the pain so you could get the free gift of life. Jesus did the work, went through the pain and paid your sin debt so you could have eternal life. Romans 6:23 says, "For the wages of sin is death; but the gift of God is eternal life through Jesus Christ our Lord." Jesus once told a man in John 3:3, "Verily, verily, I say unto thee, Except a man be born again, he cannot see the kingdom of God." The way you get "born again" and become God's child is by receiving Him. John 1:12 says, "But as many as received him, to them gave he power to become the sons of God, even to them that believe on his name:" The way to receive Him is to call and ask for His forgiveness and salvation. The Bible says in Romans 10:13, "For whosoever shall call upon the name of the Lord shall be saved." I called on the Lord and asked Him to save me Feb. 9, 1969. That is my birthday into God's family. Getting born into a human family or God's family only takes a few moments and requires the work of someone else. Growing up in either family takes a long time and requires effort on our part. Just as you need to eat, rest, exercise, etc., to grow as a human, you need to: 1. Read your Bible (II Peter 2:2), 2. Pray, talk to God like your Father 3. Go to a church that believes and teaches the Bible, 4. Get baptized to show others you have been saved, and 5. Tell others about Jesus. These will help you grow as a child of God. Many people try to do the things that make Christians grow when they have never been born into God's family first. Some churches even teach that our works somehow make us acceptable to God. Nothing could be further from the truth. Isaiah 64:6, "But we are all as an unclean thing, and all our righteousnesses are as filthy rags;" Eph. 2:8-9; "For by grace are ye saved through faith; and that not of yourselves: it is the gift of God: Not of works, lest any man should boast." Titus 3:5, "Not by works of righteousness which we have done, but according to his mercy he saved us," The Bible is clear that nothing we can do can save us, help save us or keep us saved. There is no magic prayer, God knows and sees your thoughts and motives, but if you would pray sincerely a prayer like this you could claim God's promise of eternal life: "Dear Lord Jesus, I am a sinner. I have broken your laws and stand before you guilty and deserving of your judgment. Please forgive me and save me right now. I receive you as my Savior." If you prayed that prayer from your heart, God promised He would forgive your sin and take you to Heaven. Write today's date in your Bible to remember this day as your birthday into God's family. Then, begin doing the things that help you grow as God's child. "The seed and the dirt." When you put a seed in the dirt it will grow a tree (or plant). Dirt is 100% stupid. It does not know how to grow a tree, the seed knows how to grow a tree. If the seed is left on the kitchen counter it will not grow. A seed left on top of the ground will not grow. The dirt must receive the seed. The two work together in a marvelous way. The seed grows and the dirt simply provides a place for it to grow. Jesus is like the seed. He knows how to make a new person in us, we do not. We are like the dirt, all we need to do is receive the seed and let Him grow in us. It is amazing to watch the changes that happen to a person who receives Christ. After a person becomes a child of God, it is important to get involved in a good Bible-believing church. I have studied the subject for years and feel that an independent Baptist Church like the one I go to is closest to the church model given in the Bible. Of course there are good ones and bad ones in many different denominations, so ask God to guide you. I would be glad to answer any questions you may have as you grow in God's family. 1. Read your Bible even if you don't understand it all. Babies don't digest everything they eat either but you will get some of it. (1 Peter 2:2, "As newborn babes, desire the sincere milk of the word, that ye may grow thereby,"). I use the King James Version and explain why on video #7. The entire Bible can be read in about 60 hours. The more times you read it the more you will understand it. There are about 20 old English words we don't use today that you will need to study but then it is easy. 2. Find a church that believes and teaches the Bible. Ask the pastor to baptize you to show others that you have been saved. Baptism in the Bible is always after salvation and only by immersion (Matthew 3:16; Mark 1:10; Acts 8:38). Baptism is a public symbol of the death burial and resurrection of Jesus. It is like a wedding ring. It is an outward sign to others of an inward change in you. 3. Tell others how to go to heaven. Feel free to use my videos if that will help. 4. Support the work of God with your time, talents and money. The Bible says that 10% of our increase (called a tithe in the Bible) is the least we should give to help get others saved and growing in Christ. 5. Be on the look out for the traps of the Devil. He is,not happy about what you have done and since he cannot get your soul he will try to ruin your life and effectiveness for the Lord. Jesus not only wants to save your soul, He wants to save your life. (Luke 9:56). Satan will try to make you doubt or sin. (2 Corinthians 2:11, "Lest Satan should get an advantage of us: for we are not ignorant of his devices,"). Don't get discouraged. (2 Thessalonians 3:13, "But ye, brethren, be not weary in well doing"). If you fall or fail just tell the Lord you are sorry (1 John 1:9 If we confess our sins, he is faithful and just to forgive us our sins, and to cleanse us from all unrighteousness.) and get going again. You probably fell down many times learning to ride a bike but you got up, dusted off and tried again. Call me if I can help in your new walk with the Lord. I take scores of calls everyday when I'm in the office, and my secretary can almost always find me when I'm out of town. Or please visit our site (www.drdino.com)for more helpful links. How to show the Earth is not billions of years old. Why Adam lived over 900 years. Dinosaurs that may still be alive! 29 lies in public school textbooks. Socialism and the New World Order. where did the races come, from? How do we see stars "billions of light years" away? 1 Darwin, C. (1859, 1981). On the Origin of Species By Means of Natural Selection & the Preservation of Favored Races in The Struggle for Life. Harvard University. Cambridge: MA. 2 King James Version. (1976). The Holy Bible. Nashville, TN. Thomas Nelson Publishers. 3 Woodmoraooe, J. Gune, 1981). The Essential Non-Existence of the Evolutionary. Uniformitarian Geologic Column. Vol. 18., p. 46-71. 4 Brooks, D. (September, 1982). A downward Slope to Greater Diversity. Science. Vol. 217, p. 1240. 5 Lea & Febiger. (1989). Parasitology, 6th ed. Philadelphia. p. 516. 6 Haxtenstein, R. (1998). Grolier Encyclopedia. See also "Vestigial Organs" are Fully Functional by Jerry Bergman and George Howe, available from www.drdino.com. 7 Brown, W. (1980). In The Beginning. Center for Scientific Creation. p. 18. 8 Darwin, C. (1859, 1981). On the Origin, of Species By Means of Natural Selection & the Preservation of Favored Races in The Struggle for Life. Harvard University. Cambridge: MA. 9 Glenco Biology. (1994). p. 337. 10 Leakey, M. (December, 1996). Associated Press. 11 Gould, S. (Map, 197. Evolutionist Erratic Pace From Natural History vo1.5. Harvard University. 13 Simpson, G. (October, 1950). Evolutionary Determinism and the Fossil Record. Scientific Monthly. vol. 71., p.264. 14 Science Newsletter. (August, 1995). p.118. 15 Simpson, G. (1953). Life of the Past. p.119. 16 Feduccia, A. (February, 1994). Archaeopteryx: Early Bird Catches a Can of Worms. Science, p. 764. 17 Maddox, B. (2003). Human Genome Project, quantitative A DiJproof of Evolution, CEM facts sheet. Cited from Doubts about Evolution; Young,B. (2003) Mavervick Publication. Bend: Oregon. 18 King James Version. (1976). The Holy Bible. Nashville, TN. Thomas Nelson Publishers. 19 King James Version. (1976). The Holy Bible. Nashville, TN. Thomas Nelson Publishers. 21 Dr. Karl Popper - leading philosopher of science. 22 Sir Julian Huxley - Head of UNESCO - One of the World's leading evolutionists was asked in a Television Interview why did the scientific community jump at Darwin's ideas? 23 Ruse, M. (2000). National Post. www.otnniology.com/HowEvolutionBecameReligion. 24 Sir Arthur Keith. (1959). Note: he wrote the forward to the 100th anniversary edition of Darwin's book, Origin of Species. 25 Rostand, J. (February, 1959). Age Nouveau, [French periodical] a famous French biologist and member of the Academy of Sciences of the French Academy. 26 Bounoure, L. (1957), Determinism and Finality. University of Strasbourg. p. 79. 27 Lemoine, P. Encyclopedia Francaise, volume 5. 28 Muggeridge, M. (1980). The End of Christendom. Grand Rapids: Eerdmans. p. 59. 29 Tahmisian, T. Dr. A physiologist for the Atomic Energy Commission, USA. 30 King James Version. (1976). The Holy Bible. Nashville, TN. Thomas Nelson Publishers.